Not so long ago, all corks were what are now termed natural, that is punched out of the cork bark by a skilled worker with a punching machine and a lot of patience (see photo below). Sadly these natural wine corks are gradually being replaced by agglomerated corks, which are far easier to make and do not require anything like the skill levels to produce them. I was visiting one of our cork stopper suppliers today and it really struck home – lined up against one wall were several old punching machines, but they were gathering dust and had not been used for a long while. Next to them were the modern extrusion machines, pumping out long sticks of agglomerated cork to be chopped up into wine corks. The amazing thing was that in a factory producing a few hundred thousand corks a day, there were just 2 guys working there. 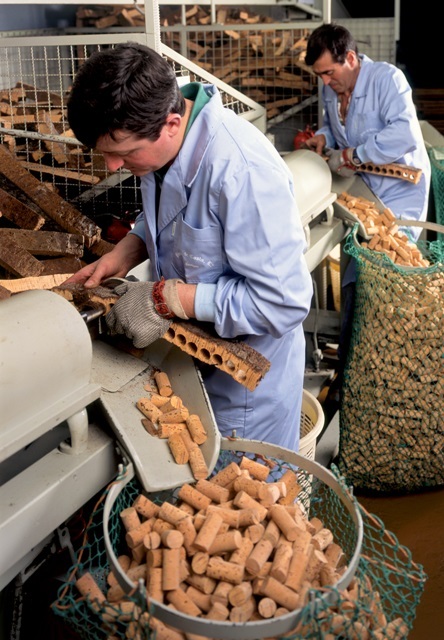 Their job was just to fill up the extrusion machines with cork granules, glue and paraffin and then to shift the corks round the factory from one machine to the next. This factory had not produced natural corks since 2010, because the wine makers understandably want to control their costs and will often go for the cheapest option available; a single agglomerate cork might cost say 4 cents, whereas a reasonable quality natural cork will cost over 10 cents. The tragedy in this is not just the replacement of skilled workers by clunking machines, but also the replacement of something 100% natural, where every cork is different with its own grain and markings, to the bland conformity of agglomerated corks. The wine industry and wine consumers need to learn the value of natural cork in terms of its functionality, its natural beauty, but also the skill that goes into making them, which pays tribute to the skill of the winemaker whose product fills the bottle.